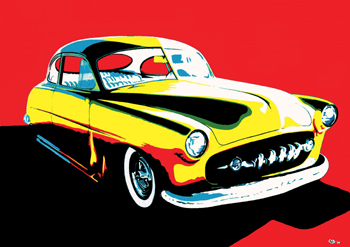 Totally Rod: To produce his Warhol-like hot-rod paintings, Caballero takes a digital snapshot of the car, loads the picture into his computer, blows up an image of it on a canvas and sketches the outline. He then fills in the car's detail with a brush. Steve Caballero helped make San Jose a skateboarding mecca. Now he's pulled the community in an entirely different direction with his newest creative endeavors. SKATEBOARDERS collect stink eye with impunity. They're chased out of glassy parking garages, pulled over by cops, blamed for devaluing communities, creating noise and breaking bus benches. A month ago, two Santa Cruz guys dressed up in maintenance uniforms were busted for trespassing on a Monte Sereno construction site and skating the pool. Police searched their truck, which reportedly had pump equipment along with cocaine and weapons. Typical miscreant behavior, right? But cut down a comfy Campbell side street where the lawns are perfectly manicured and an SUV rests in every driveway, pass through the white picket fence and clipped rose bushes, and an idyllic scene opens. This is what skateboarding legend Steve Caballero calls home. Tonight is "art night"a weekly gathering of friendsmostly local skaters with a few graffiti artists, tattooists and punk musicians thrown in. It's like a skater's version of a knitting circle. They pile into his house and play pingpong, listen to music and rap about stuff. But mostly they sit at the kitchen table, hunch over their sketchbooks or work on art projects. A small radio quietly blasts the Ramones. Caballero leans on a stepladder and combines two of his most recent obsessions: painting and hot rods. He got into classic cars in 2004 and bought a 1930 Ford Model A coupe last August. He just returned from Viva Las Vegasa vintage car showwhere he caravanned with a bunch of fellow hot rod enthusiasts. "It was the best time I ever had in Vegas," he says. Cab's working on a painting of a hot rod. He took a digital snapshot of the car, loaded the picture into his computer, blew up an image of it on a canvas and sketched the outline. The background is highlighter-pen green and he's touching up the car's detail with a skinny camel-hair brush. It's about halfway done. The piece completes a quartet of Warhol-like hot rod paintings which will be displayed at the "Writers vs. Ryders" show at Fifty 24SF, a gallery in San Francisco. To Cab, art isn't a solitary project; the company of friends is welcome and keeps him motivated. "These paintings take 18 to 19 hours," he says, between dabs. "When I'm here with friends, chatting, listening to music, I'll do it until 4 in the morning." One art night regular, Ray Stevensor RS2, sits on the porch, prepping an acoustic guitar for a new paint job. He's known Steve since the '80s when they grinded curbs and performed together in the skate punk band the Faction. Back then, Cab made fliers, 7-inch single jackets and the Faction bat logo. "Most skaters I know are into creating, whether building ramps, zines, tricks or doing art," Stevens says. "If we didn't come, he'd still be here doing it." The party breaks up around 12:30am but the host will stay up late finishing the piece. It's a new transition for the 40-year-old skater. Every platform he's been onthe ramp, the pool, the street, the mountain, the racetrack, the chessboard, the concert stageCab has excelled. Now he's rolling into new terrain, the art gallery, and he's killing it. "I don't believe in natural talent," Cab says. "I believe in the natural ability to be motivated. Talent comes from practice, lots of it." For the feeble outreach efforts that San Jose government has done to promote skateboarding as leisure activity or fuel-efficient transportation alternative, the city is still recognized worldwide as a skateboarding mecca. Many of its top prosSalman Agah, Jeff Kendall, Mike Prosenko, John Fabriquer, Gavin and Corey O'Brien, Jose Rojo, Caswell Berry, Jerry Hsu, Louie Barletta, the late Tim Brauch, etc.grew up and/or live in the shadow of Valley Fair. The skate rock phenomenonpushed by the Faction and its credo "Skate and Destroy"was born in 1982 between sessions at Caballero's backyard ramp on the East Side. With skateboarding and skate rock established local treasures, many San Jose skaters are just as stoked about art as about doing backside airs. They will get their own gallery exhibition on April 21 with "Ugly Winners"a Phantom Gallery show featuring new and old works by locals like 2004 Transworld Street Skater of the Year Marc Johnson, photographers Jai Tanju, Jerry Hsu, Joe Brook, Warren Jenkins and Brian Cullen, painters Caballero and Jason Arnold, stencilist Jason Adams and shadow-box maker Dave Nelson. Other artists include Luis Mendoza, Mark Whitely, Jermiah Harada, RS2, Erik Olsen, Louie Barletta, Royal, Justin Bell, Matt Evs, Mario Guel, Chet Childress, Mark Shiraldi, Vu Nguyen and Tim Lierman. The "Ugly Winners" title is a play on "Beautiful Losers"a 2004 Yerba Buena Center for the Arts exhibit examining the relationship between skateboarding with urban and punk subcultures. It featured works by artists like Andy Warhol, Keith Haring, Jean-Michel Basquiat, Barry McGee and Craig Stecyk. "Beautiful Losers" showed the depth and diversityfrom paintings to film, books to apparel, toys to record album sleeves. "Ugly Winners" is similar in scope, and like "BL," was spiritually born from a do-it-yourself aesthetic outside of society's perception of art. Artist Jason Arnold and photographer Jai Tanju (yes, both skateboarders) curated the "Ugly Winners" exhibition. Tanju says that the idea came from friends building up a reservoir of works with no place to show them. When they took the idea to some galleries, they got a cold reception. "They said, 'Maybe we'll give you one in two years if you give us some slides and we'll look at them, blah blah blah,'" Tanju says. In true rebel spirit, they decided to do it themselves. "You clean out your garage and go, 'Let's do it here!' Invite your friends, cook some hot dogs, drink some beer, everyone looks at the art and goes, 'Cool, rad!' You know?" Tanju wants to leave the deeper meanings alone. People should come, hang out, see some art and then hit the afterparty. If some of the artists get gallery invitations, that's gravy. "The show started as a way to have a good time and give confidence in what they're doing," he says. "It's always nice to have your stuff on the wall and have someone come up and go, 'Wow, that's real cool.' It'll make them want to do more." "Ugly Winners" coincides with two other events focusing on skaters in the arts. The Underskatement film festival, a traveling exhibit of short films made by skateboarders, will be shown on April 22 at Gallery Anno Domini. Then, Sean Clivers and a group of skaters will appear at Skateworks on April 30 to hype the second edition of Disposable: A History of Skateboard Art. Car Show: Caballero's paintings at the opening of the 'Writers vs. Ryders' show at a San Francisco gallery. His paintings also go on display this week at Phantom Galleries in San Jose. It's a natural, expressionistic rhythm for skaters to transition from skateboards to music, publishing, film or visual arts. Image has long been an intricate part of the industry. Thrasher and Vans logos are as iconic as Apple or IBM. T-shirts, DVDs, decks and signature shoes are equally as important to a skater's livelihood as exhibition appearances. Riders won't chance letting outside forces mess with the branding. "Skateboard companies don't go out and find an artist, they find an artist within skateboarding," Tanju says. "The biggest, most creative brands are run by skaters and have artists who are in skateboarding already. It's a self-sufficient thing. You don't see ad agencies coming in and doing ads for people. It just doesn't happen." Pro skater Jason Arnold paints every day. He compares completing an art piece to nailing a trick. "Skateboarding, you imagine the trick in your mind. That feeling you get when you execute it, I can't describe it," he says. "In art, you have an idea in your head, you sketch it out and draw it. When you finish a painting, that feeling is also indescribable." "The way skateboarders view their surroundings and architecture is totally different than any other person views the same thing," explains skater and shadow-box artist Dave Nelson. "It's aesthetically pleasing because of the surfacing; the terrain as a skateboarding obstacle as opposed to a building is pleasing to an architect because of the way that it's built. I look at it as a ridable surface. That carries on to every part of your life. You can't help but look at things that way." Nelson is an art night regular and lives in a historical house on North Fourth Street in Japantown. He's 29 and has been skating for 20 years. In 2003, he customized his basement living space with a ramp surface that stretches from the front door to the back wall, splitting into different directions. It's a skater's dream homeplywood planks forming slick straightaways, quarter pipes and spines and transitions, covered in intricate sketches lacquered up slick and zipping around the basement floor. He gets calls from friends on rainy days looking for a fix. Sessions have been filmed there for DVDs and an article on the miniramp will be featured in a future Skateboarding magazine article. "Every place I've ever lived had a ramp," Nelson says. "This place, I started with a backyard ramp and [the inside ramp] seemed like a good evolution for it. Every skateboarder had that dream of making an indoor skate ramp. I saw an old skateboard video where Lance Mountain had built these ramps in his house. I said, oh my God, I want that. I was just a teenager. I never lived in a place before where I could do it. This is an apartment basement, so I could do it. Nobody could tell me no. So I just did it." Many art nighters plus artists like David Choe and Sean Boyle spent three weeks inking it up. The result is a bizarre Technicolor pastiche that Miró would appreciate. "Painting seemed the next thing to do to make it more of a finished piece," he says. "It blends in with the room more because if it was just a wooden ramp, it wouldn't go. People walk in and don't realize it's a ramp, they think it's an art piece." In 1987, Thrasher magazine sent Caballero, Lance Mountain, Rob Roskopp, Pat Ngoho, Dave Duncan, Mark Gonzales, Christian Hosoi and Mark "Gator" Rogowski to Europe. They ripped pools, parks and street spots. To their surprise, Thrasher photo editor MoFo led side trips through some of Europe's finest artistic collections including the Vatican. Cab remembers being blown away witnessing Picasso's Guernica in Madrid. The focus of the trip changed and Thrasher caught it on videotape. "I thought it was cool. We thought, 'We're just going to skate,' but MoFo has a lot of art interests," says Cab. "Some of the guys weren't into it, but me, Lance and Gonz were into those things." Caballero attended Andrew Hill High School, took lots of art classes, read lots of DC comic booksbut spent most of his time at Winchester Skate Park across town. Caballero hopped on the board at 12, went pro at 16, and toured the world as an innovator. He is an all-around skatershredding pools, vert ramps and streets with equal strength and prowess. The Caballeriala trick he invented in the 10-foot keyhole pool at the Winchester Skate Park in 1980stands as one of the few rarefied airs named after the inventor (like Allan "Ollie" Gelfland, Mike "McTwist" McGill, Christian "Christ Air" Hosoi). As a member of the Bones Brigade, the team left an indelible mark on the sport with the Fab Five of Caballero, Tony Hawk, McGill, Lance Mountain and Tommy Guerrero. Cab currently rides for Powell and Vans teams. "Everything has come natural to me," he says. "I never strived for skateboarding as a career choice. It just became my career, my life, just because of how much time and dedication I put into it. So that's why I've sustained such longevity in the sport. I don't look at it as 'I make money, I stay in it. If I don't, I quit.' There's been times when I was low and not making much money but I still loved it." Growing up near Capitol and Senter roads, Steve's mom Aurora chauffeured him to and from Winchester Skate Park across town. Her biggest concession was allowing Steve to build a halfpipe that took up the whole backyard. If anyone read a Thrasher or Skateboarding magazine back in the day, the images of Cab, Hosoi and Mountain pulling sick maneuvers on this monster burned images on a par with the Apollo moon landing. The ramp sessions boosted San Jose's status in the skateboarding community. In 1982, Aurora asked her then 18-year-old son when he was going to quit skateboarding and get a real job. "I laughed at her," he remembers. "Like, 'Mom, do you know what's going on in my life?' She began to understand when the bigger checks started coming in and I started traveling more and appearing on TV. Little did she know, or I know, it'd turn into a career. I did it for fun and it snowballed into more opportunities the longer I stayed in." In 1989, Vans' first signature shoe was introduced. The Caballero, later altered to the Half Cab as it's known today, is still one of Van's consistent sellers. He won't divulge his royalty cut, but says that at its peak1995-1996the Half Cab sold around 300,000 pairs. The shoe is on its ninth edition. Today, Caballero has repeatedly hit the snooze button on the popularity stopwatch, but people still want to see him skate and he dutifully obliges. He admits that, at age 40, he's in the twilight of his skateboarding career. His responsibility as a father to his 7-year-old daughter Kayla comes first (a divorce from his wife of 6 1/2 years, Sue, is almost final). His hobbies come second. The shoe royalties allow him sizeable financial comfort. "With the success of that, I've been able to enjoy other hobbies like toy collecting, motocross, hot rods, painting. Having a substantial income allows me to be able to play." He dabs a brush in green paint, touches up a border and adds to his thought. "When I'm not playing on the skateboard," he says with a smile. The following Monday, Caballero is working with a full house. He's still high from the "Writers vs. Ryders" opening party. Cab had four paintings on the wallhuge canvases of hot rods in green, yellow, purple and blue. "I got a lot of friends support come out to the show. That was meaningful to me," he says. "It was a great vibe and it was a real fun night. Meeting new people in art and sharing the same love and interest and passionI love gatherings like that where people are having a good time. It inspired me to do more." He's back at the easel starting his latest worka painting of Dr. Zaius from Planet of the Apes. A radio plays a promotional mixtape hyping Salman Agah's new Skaterade energy drink. The guys are strewn around the table. Odd Numbers guitarist Dave Baisa is sketching from a vintage snapshot of downtown London. RS2 is tracing a luchador face onto his freshly primed guitar. Dave Nelson shows up with some drawing books. Kal Gettle is working on a clay sculpture of a pool complete with tiny tile coping. It looks like a perfect accessory for a fingerboard. Johnny Granado, one of Steve's childhood friends and owner of 5 Color Cowboy hair salon, introduces a "Pencil Fight Club" format, based on Fight Club, where art night regulars battle each other through their work. To Cab, art sharpens a different skill set but still can't compare with his first love, skateboarding. "The end result of a finished piece is not as gratifying as learning a new trick," Cab says. "You put more hard work and pressure on yourself when you're skating. Painting is expression in a more subtle way. It's challenging yourself." Cab will finish Zaius and then start a Soldier ape and a Cornelius family portrait. Over Skaterade and beats, the guys give shape and dimension to their fantasies and obsessions. There's no fear of security guards or road rash, and the end result can be seen forevernot just in the eyes of a privileged parking lot audience or a four-second video clip buried on a DVD. It's a safe harbor where Caballero and the rest sketch out their future in hopes of leaving a permanent mark. The Ugly Winners exhibit runs April 11 through May 13 at Phantom Galleries, 55 S. First St., San Jose. 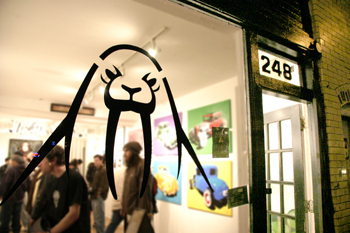 An artists' reception happens April 21, 6-9pm. For more information, call 408.271.5151. An afterparty happens at the Caravan with a performance by the Odd Numbers and DJ RS2. Underskatement, a traveling exhibit of short films made by skateboarders, plays Friday, April 22, at Gallery Anno Domini, 150 S. Montgomery St., San Jose. Doors open at 8pm and the films screen at 9pm. Tickets are $5. For more information, contact 408.271.5151. Skateworks presents a booksigning with Sean Cliver, author of 'Disposable, a History of Skate Art,' on April 30, 5-6pm. Jim Phillips, Steve Caballero, Johnny Mojo, Todd Bratrud, Todd Francis, Kevin Marburg and Jimbo Phillips will appear. Skateworks is located at 463 Blossom Hill Road in San Jose. For more information, call 408.629.9800. From the April 13-19, 2005 issue of Metro, Silicon Valley's Weekly Newspaper.